Financial bubbles and their inevitable bursting are not new features of capitalism. Economic historians point to the South Sea bubble calamity of 1720, the great railroad stocks disaster of the 19th century and the Wall Street collapse of 1929. More recently there was the Latin American debt bubble of 1982 and the dot-com internet stocks meltdown of 2000. What you may not have heard of is the “synchronised bubble”, which came to grief in a synchronised collapse in 2008. The first (but not the last) global financial crash, is unravelled in an illuminating book by John Authers, until recently the investment editor of the Financial Times and now the editor of its prestigious “agenda-setting” Lex column. The fearful rise of markets – a short view of global bubbles and synchronised meltdowns is the story of how a set of financial markets have emerged and evolved over the last 35 or so years. Eventually they became so interdependent that movement in one simultaneously found an eerie echo in another. In other words, they were synchronised. That is why the meltdown of 2008 was so devastating: all the markets crashed together. We are still living in the aftermath. Authers is referring to President Richard Nixon’s termination of the system of fixed currencies tied to the dollar, which was itself theoretically exchangeable for a set quantity of gold during the post-World War II years. Money supply was limited. Economic growth was steady and the capitalist world largely avoided banking crises and investment bubbles. The fiscal and monetary system established in 1944 at the Bretton Woods conference was aimed at avoiding a return to the catastrophic slump of the 1930s. That period, often known as the Great Depression, was characterised by competitive devaluations of currencies, import tariffs and American isolationism as each capitalist country sought to protect itself from the slump. The signatories at Bretton Woods pledged to keep their currencies to fixed parities with the dollar, to use the state to prime the economy where necessary and signed up to membership of new international bodies, including the International Monetary Fund. Capital controls were firmly established with the aim of preventing “hot money” from taking leave of a country in difficulties. Bretton Woods broke down because it could not contain the economic and financial forces at work. Dollars had leaked out of America into Europe, where they were used to buy up assets, while the cost of fighting the war in Vietnam added to the circulation of the greenback outside of the United States. The dollar itself was regarded as highly over-valued and gold backing became more illusory than real. The falling rate of profit in the United States indicated a stagnant economy and all in all, Bretton Woods could not hold. Authers himself describes Bretton Woods as a “straitjacket for governments with expensive ambitions”. Nixon threw it off with a vengeance. The total money supply in the United States rose by 10% in 1971 alone, the greatest increase on record. Inflation took off, unemployment soared in all the major economies and the class struggle took on an intensity not seen since for half a century. In 1973 oil producers tripled their prices to counter the fall in the value of the dollar. Their soaring revenues were deposited in Western banks and kick-started speculative investment. In the early 1980s, a debt crisis undermined several developing economies which had borrowed huge sums of petro-dollars from major banks. Petro-dollars were balance-of-payments surpluses from oil producing countries which were invested abroad. Latin American debt to commercial banks increased at a cumulative rate of 20% between 1975 and 1982, when Mexico defaulted. “Under Bretton Woods, capital could not flow freely from one country to another because of exchange controls… Once currencies could float, the world changed. Companies with costs in one currency and revenues in another needed to hedge exchange-rate risk. In 1972 a former lawyer named Leo Melamed was clever enough to see a business in this and launched currency futures on the Chicago Mercantile Exchange. Dismantling of post-war controls – or deregulation – actually began in earnest under Democratic President Carter in 1980, when federal state controls over airlines and road transport pricing were abandoned. Thatcher’s first act when she came to power in Britain in 1979 was to scrap controls on currency exchange. In parallel, she immediately introduced a bill that would enable council tenants to buy their homes in the first step towards the marketisation of social housing. In 1980, the US removed ceilings on deposit interest rates and in 1982 Congress passed laws that expanded the powers of the housing savings and loans sectors, enabling them to trade in other areas. In 1984, the first great privatisation was launched in Britain, with the sell-off of state-owned British Telecom, followed two years later by British Gas and British Airways in 1986. In 1986, the City of London was opened up to global competition and electronic trading in what is known as the “Big Bang”. The sales later that decade of water and electricity supply greatly increased the amount of capital now circulating in financial markets. As early as 1987, the Federal Reserve had allowed commercial banks to undertake risky dealings to the tune of 5% of their turnover, ignoring laws passed in the 1930s to prevent a repeat of the Wall Street collapse. This increased step by step until it reached 25% well before the law – called the Glass-Steagall Act – was formally repealed by President Clinton in 1999. The rise of the financial markets charted by Authers was fuelled, therefore, not just by the freedom of movement of the post-Bretton Woods period but by the untold sums of money now circulating in the system. These sums had accumulated during the Bretton Woods period and found a home in, for example, the euro-dollar market. The inflation of the 1970s and first half of the 1980s added considerably to what grew into a mountain of money that desperately needed an outlet. Add in new communications technology and you have a lethal cocktail. Authers does not properly delve into this. Instead his story is about how financial markets were transformed and new parts created. In the process, he argues, fear – or “moral hazard” – was stripped from investors’ decisions. This led to an overconfidence which in turn inflated synchronised bubbles. 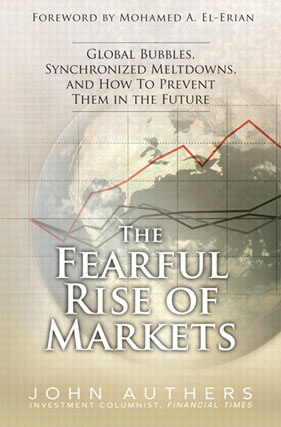 The fearful rise of markets presents an accessible survey of the markets and the role they play (in some cases played!). Authers explains how investment has been “institutionalised”, with shares mostly bought and sold by institutions on behalf of someone else, not individuals. This, he believes, led fund managers to buy into stocks that are overvalued and thus increase the tendency to bubbles. The money market consists of financial institutions and dealers in money or credit for short periods of time. In 1975, Merrill Lynch offered small investors the opportunity to buy shares in the investment bank’s money market activities together with a chequebook. Between 1983 and 2008 – the period of the growth of the super-bubble - $325 trillion (a thousand billion) flowed in and out of money market funds. Authers describes how the wall of money sloshing around the globe by the early 1980s found its way into and out of “emerging markets” (especially Latin America); into commodity markets; hedge funds (private investment vehicles); junk bonds (loans to companies no one else would touch); the carry trade (borrowing in one currency and investing in another with higher interest rates); foreign exchange (forex) speculation and the credit market/derivatives. The forex market peaked in the years leading up to the crisis of 2007. Daily turnover averaged $3.2 trillion – quadruple its level in 1992 when George Soros famously attacked the pound – and many, many times the amount required to conduct world trade. What eventually sent global financial markets over the edge, explains Authers, was the derivatives market, through which risk was offloaded by way of nominal insurance policies – known as credit default swaps (CDS). This generated the illusion that investment was risk free and allowed the creation of ever-greater amounts of credit/debt. Then came what Authers describes as “another layer of alchemy” – collaterised debt obligations (CDOs). These were bundles of mortgages sliced into tranches with varying levels of default risk. Subprime mortgages to people without jobs or incomes – were put together. Even they were considered of little risk and, in any case, gave the highest returns. Banks used them as collateral to raise more money to buy more debt. Debt was cheaper as a source of investment for companies than issuing new shares. So they borrowed money to buy up their own shares, pushed up value of those remaining in circulation. Credit and stock markets grew interlinked. “Stock market growth rested on cheap credit, not any underlying growth,” Authers notes. At the start of 2007, market prices and indices indicated that risks had been shared and that the default risk across the entire economy had been reduced to virtually zero. Nothing could be further from the truth. The scene was set for a synchronised bursting of bubbles, triggered by a crisis in the credit market. The first tremor was felt on the Chinese stock market – the Shanghai Surprise of 27 February 2007. It fell by 9%, seemingly out of the blue. But sellers were responding to news that subprime lenders in the US were in difficulty. “Markets were so interconnected that it took traders in Shanghai to alert US traders to problems in the American credit market,” says Authers. Financial markets by now were dominated by the use of short-term credit to finance deals. Borrowing was used as leverage as a way of multiplying potential gains. Why invest $1 million in a sure-fire bet when you could borrow another $9 million cheaply and invest $10 million? You were bound to make more than enough to repay the short-term loan. Imagine an entire financial system leveraged to the hilt and you get the picture of how it looked in June 2007 when a Bear Stearns hedge fund ran out of money. The fund had raised $600 million from investors and then borrowed another $6 billion against it. Collateral for the loans were packages of subprime debt resold as CDOs. Their value was falling as mortgage defaults began to take hold as US homeowners failed to pay back their debts. More than 20 subprime lenders had already filed for bankruptcy. When Bear Stearns, Wall Street’s fifth biggest investment bank, which notionally held more than $13 trillion in derivatives contracts, asked its lenders to forgo interest payments for a year, they in turn demanded the securities which their loans were backed by – or so they thought. For CDOs were not designed to be traded but held until all the loans within them had been repaid. But if the creditors wanted their money back, they would have to sell the CDOs in the market. This they attempted to do by holding auctions. The episode marked the beginning of the great unravelling. Banks that held large amounts of overpriced CDOs – for which there was no market in any case – were suddenly facing insolvency. Short-term lending began to dry up as fear overtook confidence. The credit crunch took hold and the banks began to tumble, starting with Northern Rock in the autumn of 2007 and culminating in the collapse of Lehman Brothers, Merrill Lynch and the world’s biggest insurer American Insurance Group one weekend in September 2008. Authers contends that market “value simply evaporated because it should never have existed in the first place” and notes that 16 different “asset classes” – including government and corporate debt, equities, loans and commodities from around the world – fell almost at an identical rate. After the synchronised crash came the massive, belated response by governments on both sides of the Atlantic. Failing banks were nationalised and immense funds created to buy up toxic assets on bank balance sheets. Ordinary depositors were guaranteed all their money in the case of bank failure. The collapse in economic activity that the credit crunch precipitated was met with “quantitative easing” – the printing of money by central banks in a bid to prevent the recession turning into an all-out slump. By focusing on “distortions”, Authers leads inexorably to a series of conclusions about bringing some kind of order to markets, to disentangle and make them “unsynchronised”. This would require new levels of global regulation and a decision by governments to break up banks and show that they will not bail out the reckless. The absence of this “moral hazard”, he believes, was a key factor in the build-up of the super-bubbles. As we saw, the actual origins of the modern financial system and the parallel globalisation of the world economy, are to be found in the breakdown of the “managed capitalism” of the immediate post-war period. And the underlying cause of this was the falling rate of profit in the United States and other developed economies. Karl Marx established that capitalism as a whole continuously expanded the means of production out of necessity. In the course of production, fixed capital – machinery and factories, together with raw materials – expands at a faster rate than what Marx designated as variable labour, the workforce. As a result, there is a progressive cheapening of products because, as Marx explains, “every individual product, considered by itself, contains a smaller quantity of labour [and thus value] than it did on a lower level of production”. So here’s a paradox. Under capitalism, the tendency is for output to rise, through greater productivity by workers, while the price of each commodity falls along with the rate of profit. Of course, the cheaper the commodity, the more that have to be sold to maintain profit levels. Herein lies the built-in source of capitalist crisis, not in the psychological flaws of market traders or in human greed. This modern phase of the globalisation of the world economy was made possible by foreign direct investment (FDI) and other global capital flows as well as the revolution in communications and information technology. FDI is the term given to the purchase by a corporation of assets like land, factories or other companies in another country. For example, over $950 billion flowed out of the US in FDI between 1990-99, compared with $122 billion between 1970-79. A similar sum flowed into America in the 1990s, as countries like Japan invested in manufacturing outside of their own country. This enormous movement of capital continued right into the 21st century as new capitalist economies emerged in South and East Asia. In 2000, over $1.2 trillion flowed out of the developed economies – more than ten times the total for 1986. By the 21st century, a 100 or so transnational corporations dominated international production and trade. Although the rate of profit in the US economy began to recover from the mid-1980s, it was still a long way from the levels enjoyed in the post-war period. And, like in Britain, the upward movement in the rate of profit in the US was at a cost in terms of jobs, pay and, in the longer term, unprecedented levels of state, corporate and personal debt that drove on the meltdown of 2007-8. Both the British and the American economies switched production overseas and concentrated instead on the financial services sector. As emerging economies in Asia came on stream, the output of commodities soared on a global basis. 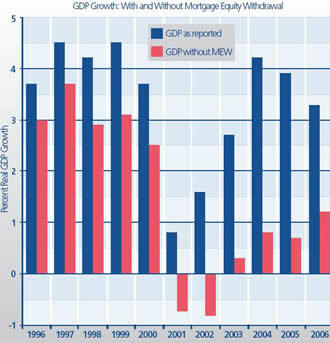 For example, the number of passenger cars produced globally rose from 38.5 million in 1995 to almost 53 million in 2008. That is an increase of about 37% in 13 years. With global corporations sourcing materials in the cheapest, most efficient way and producing cars with fewer and fewer workers, prices have tumbled – and so too has the profit made on each vehicle sold. The toll on the world’s eco-systems as a result of this frenzied plundering of natural resources goes without saying. But the rapid advance of global warming and climate change is another chapter in the story. Corporations, consumers and governments queued to borrow – and a debt mountain began to grow that in 2007 finally collapsed in a heap. That’s how the globalisation process as a whole was funded. Debt, unsustainable debt, was the key, to the growth of the global economy. Essentially, this was an attempt to overcome in a financial way the tendency of the rate of profit to fall. Of course, credit/debt is necessary to oil the wheels of an economy. 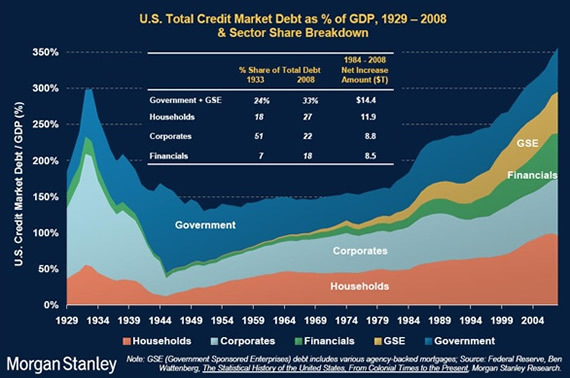 In 1952, the United States was emerging from the Second World War and the conflict in Korea with a strong economy, and fairly low debt, split between a relatively large government debt (amounting to 68% of GDP) and a relatively small private sector one (just 60% of GDP). Over the next 23 years, the volume of debt increased, but the rise was broadly in line with growth in the rest of the economy, so the overall ratio of total debts to GDP changed little, from 128% in 1952 to 155% in 1975. From this period onwards, however, the gap between debt and GDP grows wider and wider at a faster and faster pace, as the graph demonstrates. By 1985, the landmark of 200% greater than GDP was passed. Output rose eight times between 1975 and 2007. But the total volume of debt rose a staggering 20 times, more than twice as fast. The total debt-to-GDP ratio surged from 155% to 355%. Private debt outstanding has risen an enormous 22 times, three times faster than the economy as a whole, and fast enough to take the ratio of private debt to GDP from 117% to 303% in a little over thirty years. Here was a country consuming wildly beyond its means, where it took $3 to generate $1 of “growth”. This was clearly unsustainable, especially in a country where manufacturing as a proportion of GDP had fallen below 15%. It’s a similar story in Britain, where total debt in relation to GDP is not dissimilar to the position in America. According to the accountancy firm Grant Thornton, the amount of money owed on mortgages, loans and credit cards in 2008 hit £1.44 trillion. This just exceeds GDP. This means that personal debt levels increased by 7.3% in a year, and was higher than economic output for the second year running. At the same time, official figures showed that British households were now more indebted than those of any other major country in recorded history. Families in the UK owed a record average 173% of their incomes in debts. The ratio of debt to income is higher than any other country in the Group of Seven leading economies, and is sharply higher than the 129% of their incomes it was five years ago, according to the figures, published by the Office for National Statistics in 2008. UK company debt has risen to 111% of GDP, up from 76% at the end of the 1990s, while government debt is an estimated 56% of GDP, rising to an anticipated 100% within three years. The evolution of the “assets” side of the balance sheets of commercial financial institutions followed a similar path. In 1980 the value of the world’s financial assets held was more or less equivalent to the value of global gross domestic product (GDP), which is a measure of the output of an economy. In little over 10 years, this relationship changed dramatically. The ratio went from 1:1 to 2:1 by 1995 and by the time of the crash of 2007, it stood at about 3.5:1 in favour of the “value” of financial assets over GDP. All these financial assets, remember, have (or had) a call, somewhere along the line, on future profits, interest payments or the sale of assets in the productive economy. McKinsey’s analysts added: “The growth so far has been accompanied by a striking shift away from banks and toward market institutions as the primary financial intermediaries. That change can be seen in the declining share of bank deposits in the global financial stock – to 29% today, from 45% in 1980 – and in the corresponding increase in the share of debt and equity securities.” In ordinary language, the report was pointing out how trading in debt through securitisation had assumed top position in the table. And the “value” of all global financial stock? It was estimated at 334% greater than the value of global GDP, whereas in 1980, you will recall, it was more or less equivalent. Now the financial system spun into a real frenzy, in fantasy land. Within two years, $136 trillion became $167 trillion – an increase of more than 22% in 24 months – with most of the increase coming in 2006. Now “financial depth” – which is how McKinsey’s fourth annual report described the relationship of this $167 trillion to global GDP was almost 350%. Half the total increase was down to a rise in shares on the world’s stock markets. The report showed how the globalisation of the financial system had led to foreign investors owning one in three of all government bonds around the world. The 21st century had seen a debt-fuelled consumer binge that masked a decline in the productive economy. In parallel, the global financial system became increasingly divorced from the real world, let alone the real economy. It found its high point – and eventually its nadir – in the exotic world of collaterised debt obligations. Transferring the risk off their normal balance sheets into “structured investment vehicles” allowed banks to lend even more to people, governments and corporations. With global interest rates at an all-time low, banks had to lend more and more to generate income. Indeed. Now the financial markets are back in the saddle, dictating to governments and defying pleas to resume lending. Authers, like many of his fellow analysts, calls for regulation, but the burden of his account reveals that this is simply unrealistic. The synchronised global markets of today cannot be tamed, regulated, controlled, disciplined or restrained. The markets are a law unto themselves and need to be put out of their misery because virtually all their activity is for shareholder gain and serves no useful social purpose whatsoever. A new, socially-responsive, not-for-profit financial system has to be put in its place. That task is clearly beyond the capacity and will of capitalist states and governments. The fearful rise of markets by John Authers. Financial Times Press £20.